The fresh air was exceptionally refreshing and the steady light rain added to the feeling of being cleansed and purified on all levels — body, mind and spirit, through every cell atom and molecule. A bonus over the 5 mile hike was that the rain kept humans away–there wasn’t another soul throughout the whole trek. There were only the sounds of my breath, the hiking poles and my feet against the earth, squirrels scurrying about, the tapping of the rain against the leaves the whole time. I hiked through tunnels of red, yellow and orange leaves that acted like a natural umbrella keeping the trail beneath dry and only where there were a few breaks in the trees was the trail wet. It was a cool day too (temperatures in the 50’s) and occasionally a cold wet drop of rain would hit my head. I’d pretend it to be mother nature blowing me a kiss from above and smiled all the more when that happened. The human body is an amazing machine. Strange how I’ve always known this and actually in my previous profession (seems like a past life now) as a physical therapist that was so simply understood. I helped patients come back from all kinds of physical setbacks–stroke, surgery, heart attacks. The body responds to training, plain and simple. For them but not for me? That doesn’t make sense. Yet, lately it’s a different story. For the first time in years — even with the 1-mile swims in the lap pool and the hour intense spin-bike sessions — these hikes have strengthened me in ways that truly give me hope. Hope that … well, that it’s not over yet! What I mean is that each hike makes me feel younger in ways that no other exercise has done! 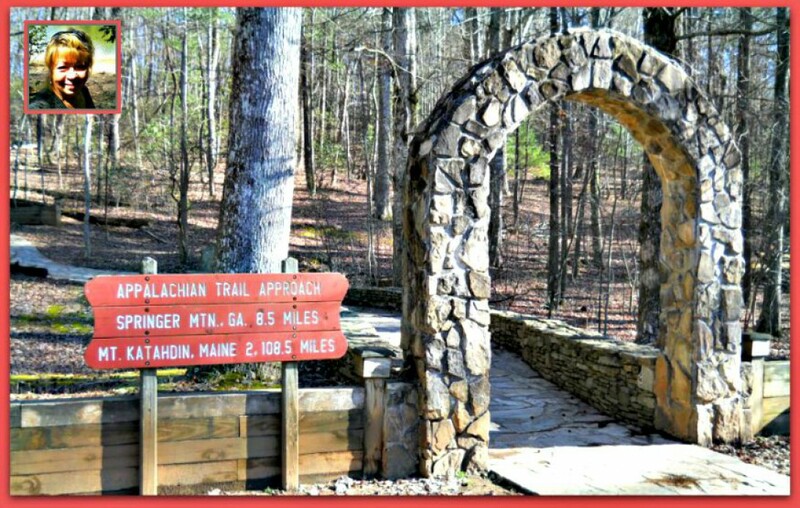 And the window of possibility to being able to hike on the Appalachian Trail that cracked open in July 2015 when this blog was started, has opened a bit wider this week. I’m psyched! 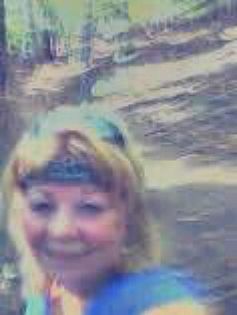 The first time I hiked that 5 mile trail it took me 4 hours. Yesterday it took me 2 hours, 3 minutes. A Personal Best! After the first time, totally spend–exhausted–came home and collapsed on my bed for hours. Yesterday, walked around Wal Mart and then had dinner at Applebee’s Restaurant with my daughter after the hike. Yesterday was the first time nothing hurt during my hike. Previous hikes contained a good deal of yelling that was coming from my knee and ankle and residual soreness. Yesterday, there was nothing of that nature whatsoever. This hike’s for my mental health and spiritual nourishment. That was my intention and what I repeated as i strapped on my waist pack. 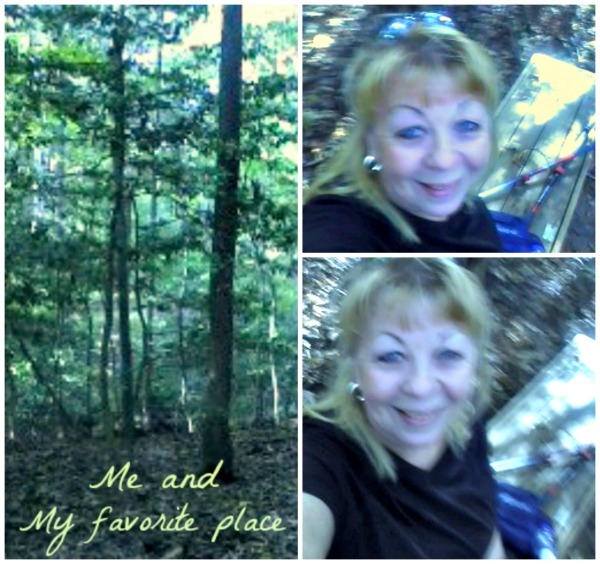 I needed the silence of the woods and fully intended to enjoy the 5-mile hike and I did. I stopped to enjoy the breezes off of the lake and look up at the trees and the sun winking through the leaves. My pace was reasonable and at mile one there’s a bench placed on a curve facing the water; and this time I took the seat and breathed deeply as I watched the many small waves dancing and glistening. The the wind and sun created this wavy sparkle upon the lake. As I was on my way to that scenic spot, I allowed my mind to wander and thought about how grateful I am to have the opportunity in life to just drive off to the woods for a hike. (Not that I haven’t worked physically, mentally, spiritually and emotionally to reach this point! — mostly spiritually, mentally and emotionally) But anyway, then I dedicated all of my hiking steps to others who might be wishing they were there hiking too but couldn’t be. I called to mind the spirits of the woods, the nature devas, the spirit of the lake herself and all the angels and friends of the light as deep waves of love and gratitude for being in that very spot at that very time permeated every cell, atom and molecule within me. Then I sent those vibes out into the world and chanted silent thank you’s for every blessing that I could call to mind all the while cherishing the feel of the breeze on my body as my inner and outer ears danced in joy with the song of the birds. This will be a great hike; I vowed it. And I let myself sit a moment longer drinking from my water bottle. The body drank while the spirit was drinking in all of the nature spirits and elements. I felt at one with the woods and the lake. The world here was silent. I felt each moment fully there, pausing at mile one. Since yesterday, I’m trying to figure something out. Its about a 1,000 foot climb. How high is 1,000 feet? There’s 300 ft in the length of a typical football field. So we’re talking about a climb that’s 31/3 football fields high. Can’t really imagine that. There are a lot of those and higher on the A.T. — an intimidating thought. Now these 3 football fields high could be spread out over a couple of miles or more I suppose, but still! How steep the climb is — that’s the real question. But honestly after a series of hills spread out over 5 miles that are only 1/10th as high, I’m pretty tired after doing those 100 ft. roller coaster hills. The thought of 1,000 feet seems pretty overwhelming. I’d have to take a lot of rests or get in a whole lot better shape! I’m wiped out thinking about hiking up elevation like that. ADDENDUM: I wonder how high the typical high school football stadium seating is? I could go practice there. GETTING IT STRAIGHT: okay, okay, hold on… now I’ve got it straight I think. I found a website for the biking trails that gives elevation gains and also found elevation gain on the 5-mile trail I’ve been hiking–what would we do without Google. So yeah, 100 ft climb (elevation gains) on the 5 mile trail. But now I see a really amazing challenge with a 356 ft elevation gains and that trail is 10 miles long –so that’s something to work toward. I hit the trail again yesterday. 5 miles in 2.5 hours. It’s been a week and too long between hikes if I intend to prepare to hike the A.T. but do I? I’m keeping the dream alive and all options open but meanwhile a few thoughts. One of those being with 4 miles under my fanny pack waist belt as I trudged uphill, the thoughts went something like “no more pizza or hamburgers girlfriend!” as I lectured myself on the virtues of loosing a lot more weight. I was just demoralized by a guy who jogged past me going downhill and there I was in the process of pausing for some water and monitoring the last two miles effort on my heart rate monitor. Of course this guy was coming from the end of the 5 mile loop trail toward me, but the humbling point here is that moments later he ran past me a 2nd time going uphill. I felt like a turtle who was just passed by the rabbit and tried not to cry thinking about the years that I’d let myself go, as it were. I used to run everyday and regrettably I’d stopped a daily running habit many years ago. I was patient waiting for the magic moment to happen. I was past the 3 mile mark and just about to give up on the idea when suddenly I came to a small clearing in a gap between the hills where there were no trees–a nice sunny spot. I stopped hiking and just stood there feeling that this was a special place and then it happened.